In earthquake country you are supposed to sleep with a crow bar under your bed. This suggestion may stop a conversation right there. The implication that you will have to pry yourself out of your own bedroom is enough to paralyze many of my clients. So then I talk about picking out my earthquake outfit. Now I sound silly. The house has fallen down and I should worry about what I'm wearing? Well heck you have to start somewhere. A pair of sturdy shoes by your bed is advised so that you can protect your feet from things on the floor that have broken. There's a picture in the earthquake emergency brochure that came as an insert in the paper shortly after Katrina. It shows a pair of shoes in a plastic bag tied to the leg of the bed. This made me laugh, but the plastic bag got me thinking in a practical way. I already had a pair of shoes by my bed, easy to pull on and warm with thick crepe soles. They were fake fur after-ski boots a client had discarded. I realized they would look pretty ridiculous with the usual t-shirt and boxer shorts I wore to bed, so I looked over my work clothes and picked out a pair of brown Cathart overalls I seldom wear. Now I looked a bit like a fireman, but overalls are easy to pull on and have lots of pockets to stash things like a first aid kit, a bandana and gloves. I lay them folded in the bottom storage cubby of my bedside table. On top of the overalls I put my largest flashlight, the foot long black mag light. I did have occasion to use the flashlight once when we heard a loud crash coming from the hall in the middle of the night. "It's a bomb," said Catherine who is inclined to think the worse. Then we heard a reverberating sound like someone sawing wood. "There's someone trying to get into the house" Catherine concluded. I grabbed the flashlight/weapon and turned it on to find that the cat had somehow fallen into the toilet and the crash was from the seat hitting the toilet as she scrambled to get out. I realized that she had been attracted by the noise of a rat that had been sharpening its teeth on one of the wood studs inside the bathroom wall. I turned on the lamp and went to rap on the wall. It is amazing how many people living on California faults lines do not have a rudimentary emergency plan or kit. Even Katrina wasn't enough to drive the point home that a tall handsome fireman would not be arriving shortly to pry open the door and carry us to safety. "I'll be dead and I won't have to worry about it," say some despondently. Others are brazen enough to laugh at such concerns; visions of backcountry Y2K survivalists, hoarding cans of tuna, coming to mind. After Katrina I started asking people if they had an earthquake kit. A cheerful article in the Chronicle home section told of how one housewife had put together hers. A fellow gardener in my neighborhood garden circle had followed the instructions to the letter down to packing everything into a new garbage can, with wheels, in case of evacuation. We shared our notes at our monthly potluck. My gardeners were well prepared down to the extra bags of dog food in the tool shed. My organizing colleagues, too, were highly likely to be prepared even the self-designated "messy" ones. We like to follow lists, find appropriate containers and put things where they belong. Organizers envision a quick, tidy recovery from catastrophe. Next of those inclined to be prepared were outdoor types who camped. After all we had most of the equipment already and enjoyed setting up temporary shelters. It was just a matter of storing it altogether outside. This was my next hurdle. Wrapping my mind around the thought that the house would be lost was bigger than just crowbarring my way out of the bedroom. Still camping out was far preferable to the Superdome solution of government emergency shelter. I pondered if I should get a trailer for my bike, but settled for a dolly with big tires that I happened to have. The idea of evacuating on foot was still somewhat absurd, but maybe you would just be dragging the gear to your car. And there was the next component. Car as foot locker/escape vehicle. It would, of course, have to have gas in it at all times which means you must fill it up when it is half empty. This is the habit that separates those who are serious about emergency preparedness from those who just think about it in the middle of the night. And since you'll want to be able to get into the car, if you just ran out of your burning house say, it's good to have an emergency key in one of those magnetic boxes. AAA Lock had a nice selection and advised me on where to put it - on top of a metal surface like the bumper so it doesn't have a chance to bounce off. I assembled my "bug out" bag. That's what they call it on those survivalist websites. Into a large backpack went a change of clothes, poncho, jacket, toilet kit, first aid kit, water, Cliff bar, wind-up radio, Swiss army knife, pen and paper to leave notes, two clean t-shirts to cut up into slings and bandages or use as a dust mask, weatherproof matches and a 50 foot length of nylon cord plus all the usual tools I keep in the car and that handy pry bar. 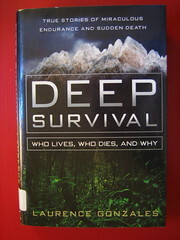 By now I had read a number of books on survival skills, the best were quite humorous, anecdotal and fascinating. What indeed, did separate those who survived from those who didn't? What got that climber off the mountain when he had two broken legs? On the whole it was largely an ability to assess the reality in front of him and the willingness to do what was necessary to get across the next 20 yards. Focusing on the task at hand was the common theme. This is not the time to think of the big picture. You do not want to go there. It will overwhelm you. Make jokes to cut through the emotional fog. Notice, with detached awe, the scene before you. Okay, but what about being at home when social services and food supplies are cut off? Seventy-two hours is the time given by government agencies when educating citizens on how much food and water to have on hand. It implies that we just need to give our professionals a few days to take care of the damage before utilities are turned on and things are back to normal again. After Katrina, the parameters changed. It could be weeks. A friend bought a 50-gallon barrel for water. 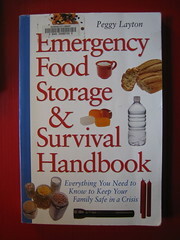 A book I checked out of the library, "Emergency Food Storage and Survival", talked about having six months to a year of food and rotating it on a regular basis. She included recipes for cooking with the dry grains and flour stored. Wow, I realized, this is how the pioneers did it; this is a way of life with a level of self-sufficiency that involved ongoing skills. I am not a cooking enthusiast, but I could see how useful it would be to learn to cook from scratch. These were food stocks that didn't need refrigeration. I dusted off my solar oven and threw that into the mix. At the peak oil workshop Catherine and I attended, we learned that grocery stores only have two or three days of food on hand. Should supply lines be cut off due to a gas shortage, the whole town would clear the shelves in a day. It wasn't hard to imagine. On New Year's Eve in 1999 I went to the gas station to fill up and their candy bars and bags of chips were completely bought up. At Safeway the bottled water section was almost entirely gone. I laughed. I didn't believe in Y2K, but it did make me wonder at all these people with their last minute thinking. Our modern way of life is precariously perched on long supply lines that reach across oceans, while our shelves are filled with back issues of magazines, CD collections and memorabilia. Nowhere in this system is there a back-up supply source for all that we have taken for granted, yet we laugh at the idea of shortages. Is there not a dark irony to this? The peak oil inspired localization movement is trying to remedy the flaws of this centralized system by rebuilding communities with local food and energy sources in mind. They start by asking questions about what their citizens value and how might the community insure that they continue to get these goods and services should they be cut off from outside supply lines. They calculate what they needed to keep on hand in the ways of medicine and supplies. This is a similar process to how a family might talk about an emergency plan. "I want to start canning our blackberries next summer," Catherine said the other day. Our discussions about emergency planning largely revolved around food, which also tied in with what Catherine had learned from reading The Omnivore's Dilemma. Eating out of one's own garden had become increasingly attractive for ecological reasons, for economic localization and for increased self-sufficiency. For the last ten years, I had been in charge of what food we ate out of the garden, growing our summer tomatoes, cucumbers and basil for pesto. Now Catherine was talking about turning the compost pile and I wasn't sure I wanted her messing in my turf. I had done things my way in the garden for too long. We decided to hire a coach to help us with our food growing and to settle our disputes about how things should be done. Yes, an urban farming consultant. I had met one just recently on a Permaculture garden tour. Maggie, a young woman, headed for a career as an agronomist, had spent two years apprenticing with John Jeavons, Mr. Biointensive Gardening himself. I had taken his three-day weekend workshop many years ago. Maggie sat at our kitchen table and taught us about growing plants from seed. How the seeds grown in a mix of our own gardening soil and the compost we had made were three times more suited to thriving in our garden than nursery grown ones. We learned how seeds grown in flats, together in community, would help each other, signaling to each other that it was time to sprout so that they might benefit from shading each other and forming a mini-micro climate together. 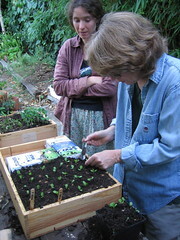 Then she showed us how to sow the seeds in flats I had made from wine boxes and two weeks later how to prick out the seedlings and transplant them. She hummed as we worked. We followed her teachings exactly to avoid arguing. I changed how I had done things in my slapdash way and Catherine learned the new skills exactly as prescribed. It was better than couples therapy. Last weekend we attended a Permaculture workshop and discovered a new/old way of looking at the world. Within the Permaculture parameters were all the design elements that described a localized community built to conserve resources and energy in a way that was customized to the terrain. Plus they talked about planning for catastrophe as part of the design. Here was a system that allowed for flexibility and change, one that could roll with the punches. It was a far cry from the homogenized, energy intensive, disease prone, centralized system that controlled our food supply and every other aspect of our industrialized lives. 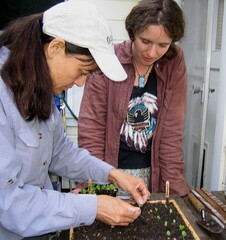 Permaculture gave us a way to opt out of the centralized system that would also become our shared hobby. 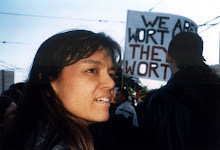 Here was something we could do now, at home, to create the new paradigm while living it. It was a powerful and practical ethic by which to live our values. We can't wait. Did you know that Redwood City is offering a 20 hour CERT class starting this Wednesday? > 780-7400 or email from the website link. Although you will probably be at the EV rally on the 30th. I will be there, too. I'm trying to decide whether to bring my Charger electic assisted bike or my NuMotion scooter. I'm going to sign up for CERT and still try to get to the rally later in the day. I've seen lots of electric assisted bikes, but don't know the NuMotion Scooter. Excellent post. We get earthquakes fairly frequently in Japan. I keep shoes and clothes to jump into by the bed too, as well as a hand powered flashlight. Your information on permaculture is valuable as well. Thanks for sharing all these ideas. We get some nasty storms in the midwest that can knock out power for weeks. People always seem to panic too. That's why in recent years I've been working towards being more prepared. Thanks for the book suggestions by the way! Real Men Don't Go Vroom!